Sometimes no matter how much spring cleaning you do, there's just too much stuff to organize! 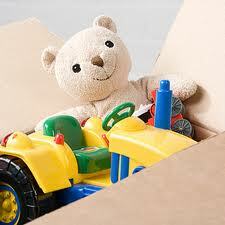 Between the toys, stuffed animals, clothes, shoes, books, etc., children's rooms can become cluttered in no time. Having more stuff than can fit on the shelves or in the closet can make kids feel overwhelmed and unwilling to help clean. Fortunately, you can avoid this conundrum and teach your kids the importance of sharing and giving back by encouraging them to donate their unused clothes and toys on a regular basis. Whether you donate once or twice a year, or every time a new toy joins the toy box, you'll help your child become more compassionate and generous by limiting his or her belongings to only the essentials and sharing the rest with others. Goodwill of Orange County has donation locations across the county and also offers a pick-up service. Salvation Army in Anaheim accepts all donations and will send someone to come pick them up. Children's Bureau of Southern California accepts specifically kids toys, clothes and educational activities. Click here for more donation locations, and remember that friends and family members are also great for re-appreciating an underused toy or sweater.